Design and project planning are the fundamental creative and technical skills that most artists employ each time they embark on a new project. 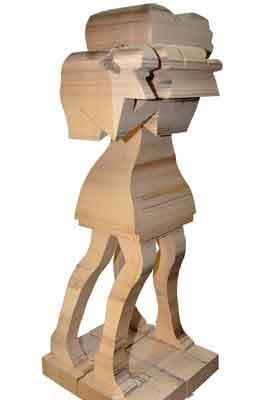 It allows them to develop ideas and transform their concept or vision into a tangible three dimensional form. Every artist will undoubtedly develop their own individual techniques or approach to project planning in their choice of medium, and will naturally cultivate their creative thinking in order to solve various problematic occurrences that the medium, by its very own nature or limitations, may generate. 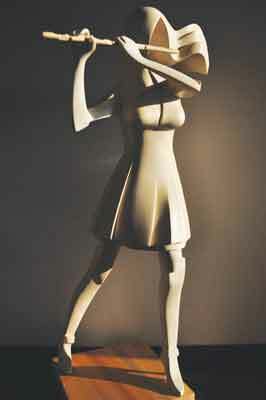 There are obviously many different media in which to create three-dimensional sculpture but with reference to the technical methods of execution of these materials, the processes that are required mainly fall into two categories: construction and deconstruction. One method of construction is to initially make a basic armature - a skeletal framework built with wire as a support onto which a clay, wax, or plaster figure or form is constructed, which can then be modelled with a variety of tools to create the desired shape. It can be useful for the woodcarver to make a small maquette of the design concept to problem solve various areas of detail that are complex and difficult to visualise and sketch. Deconstruction is used when working with media such as wood and stone, which require very careful planning to ensure that waste material is accurately removed, as it cannot be reapplied to an aesthetically pleasing finish if mistakes are made. The human form is an incredibly complex structure of connected moving parts. These have to be carefully studied and experimented with over time to develop a deep understanding of exactly how to produce a lifelike composition. 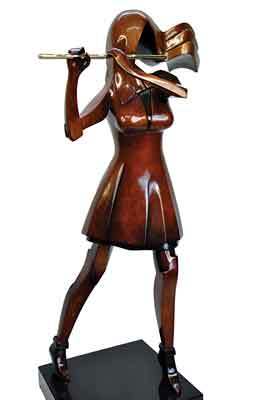 The example that I am using is a sculpture of a flautist from my female figurative series called 'Rehana'. When working with figurative forms, it is essential to have a good understanding of your objective, of what you want the finished piece to convey and resonate. Generally speaking, one of the most important factors is vitality. In this example, the essence was to capture the energy and dynamic life of the flautist as she passionately and creatively became at one with her instrument, her body movements flowing in harmony with the music. 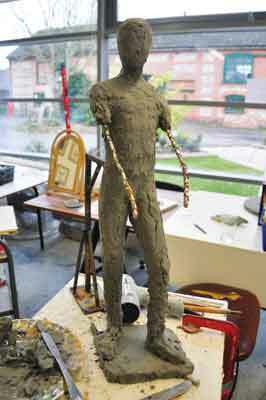 To effectively produce a figurative sculpture you need to work closely with a live model and to use the tools of observation, photography and film to build a body of reference material from which to work. This material is essential to study the subject closely in the specific context of the pose. The carver needs to identify and clearly understand exactly how each part of the figure and its anatomy should be formed to convincingly produce a sculpture that does indeed breathe life, creating the desired result and impact on the viewer. This lady is a highly accomplished musician and her brief was simply to play various passages of music that she felt passionate about and that would take her to a level where her creativity and emotion within the music would run in harmony through her. Two cameras were used; one positioned in front and the other to her side. As she played through her repertoire and became at one with her instrument, images were taken at moments of musical crescendo that captured the essence of her creative performance. There are a number of very useful three-dimensional computer graphic tools that are available today; an excellent one called DAZ 3D is actually free to download, which is astonishing as it is a brilliant and powerful tool. 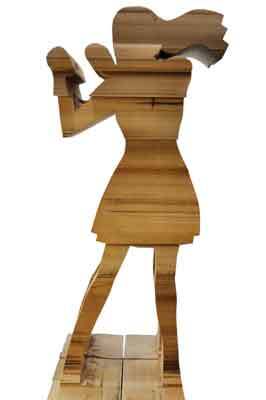 The 3D computer graphics tool that I use when working in a figurative style is called 'Poser', made by Smith Micro. 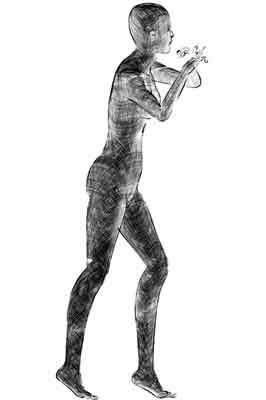 I use this to build complete human forms in any size, pose and gender, which can then be rotated 360° in any direction to study specific areas of the form that are being worked upon. 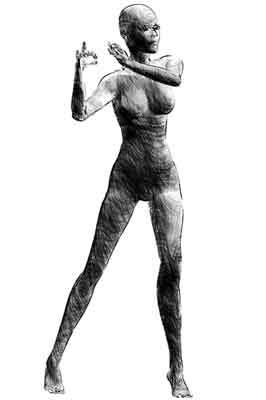 Every minute detail of the figure can be tweaked to alter its angle and appearance, including skeletal and muscular systems, skin colour and texture, eye colour and a multitude of other effects including animation. Hair and clothes can also be added to the 3D graphics within the software interface if required, but I tend to work with the naked figure to create the exact position of the pose that I wish to represent. I then apply the clothes and hair by hand to the printouts of the scale designs. Pictures can be taken within the software from absolutely any angle of the figure, and then be printed out to use as reference material. 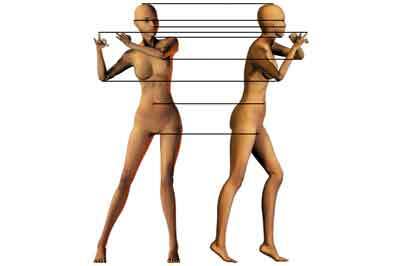 The light direction and intensity can also be altered to produce the exact required effect at any position. I use this software in combination with my body of live model reference material so that I can build a three-dimensional graphic model with all of the characteristics, movement, emotion, life and dynamic energy of my real-life model. I can then work with the rendered figure at my own speed to produce a figurative piece in my own style that captures the dynamic of the live model. One of the main advantages of utilising such software to plan a figurative sculpture is that you have the ability to produce the essential artwork and reference material that you need in absolute perfect scale from any angle and without any camera lens distortions whatsoever. This is vital for accuracy and virtually impossible by means of photography without various corrections having to be made to rectify the effects of perspective, barrel and pincushion distortion, etc. 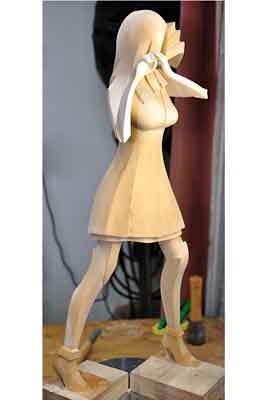 Another advantage is that, for obvious reasons, one can't have a live model at hand throughout every process of creating a figurative sculpture. 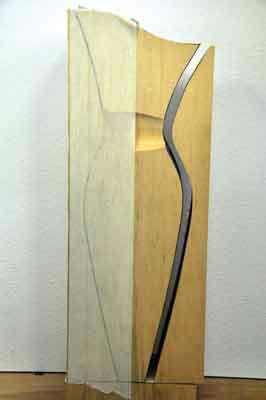 To have a three-dimensional graphic of one is of high value and extremely helpful in achieving accuracy through the various stages of execution, especially the ability to be able to rotate the figure in any direction to observe the surface anatomy and see how specific areas of the form behave in relation to one another in three dimensions. When all of these stages are complete, it is finally time to move on to the next stage of the project and cut both the front and side-view out of the block of wood in preparation for carving. The cutting of the subject's profiles is the procedure of removing all of the waste from the edge of the design that you are working on. Creating this precise outer line enables you to start the carving procedures - deconstruction - accurately. This requires front and side-view drawings of the design which are exactly in scale with one another. These can be printed out onto card and used as templates from which to draw them accurately onto the medium so both profiles line up precisely when the block is cut. 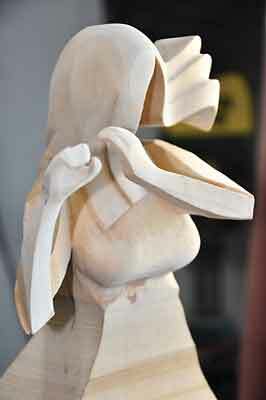 When the waste wood has been cut away from both front and side profiles it is ready to be carved. Even a quick glance at this bandsawn shape will immediately show you the complexities of the form that have to be methodically worked through with precise accuracy. This underpins the need to have a good body of prepared artwork and live model reference material - all in perfect scale - to be used as reference from the very first stage to the final execution.